You can ask that question to Robert DeNiro! 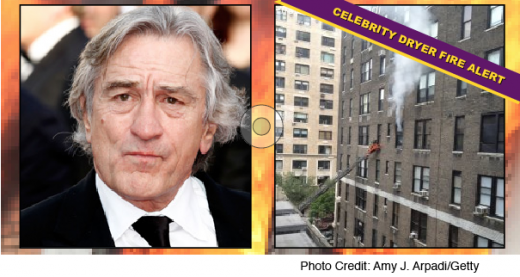 Robert De Niro’s Central Park West apartment went up in flames when lint in a clothes dryer caught fire a few years ago. “Right above my head these 12-foot-tall flames exploded out of the 5th floor window,” said Nathan Bear, 23, who was outside moving his car. The fire started around 2 p.m. in a pricey high rise near West 68th Street and took firefighters an hour to get under control, officials said. “The dryer in 5W caused the fire that spread through the entire 5th floor,” said Battalion Chief Mike Meyers. The 5th floor had extensive damaged from the fire, smoke and water, fire department officials said. The 4th and 6th floor apartments were also damaged in the all hands fire, Meyers said. Did you know that dryers cause more fires than chimneys? There is no way to know when a fire can sneak up on you, that’s why the manufacturers and fire departments recommend early cleaning and inspection as the only prevention. “I clean out the lint screen every time I dry clothes. Why isn’t that enough?” It’s not enough, most of lint gets past the lint screen and accumulates in the air ducts. • Clothes are hot but still damp after one cycle. In average there are about 12,700 clothes dryer fires a year resulting damages, 330 injuries, and 20 lives lost. Regular dryer vent cleaning will also help your dryer to run more efficiently drying faster and economically.